The freshman congresswoman first attracted attention to the proposal when she joined more than 200 protesters staging a sit-in in support of a GND in Minority Leader Nancy Pelosi's (D., Calif.) office. Since then and with Ocasio-Cortez's backing, the idea has swept through left-leaning media, attracting fawning reviews. It also has the support of a number of prominent left-wing environmental activists: deindustrialization advocate Bill McKibben has come out in favor, as has former Vice President Al Gore. "This is going to be the Great Society, the moonshot, the civil rights movement of our generation. That is the scale of the ambition that this movement is going to require," Ocasio-Cortez said during a Monday town hall with Sen. Bernie Sanders (I., Vt.). The leftist proposal for A Green New Deal is not exactly new. It was central to Dr. Jill Stein's campaign for president under the Green Party banner in both 2012 and 2016. But the idea is gaining currency among lawmakers: alongside Sanders and Ocasio-Cortez, at least fifteen members of the House of Representatives have expressed support. A "Green New Deal" is unlikely to get major traction in the narrowly Democratic House, never mind pass the Republican-dominated Senate or make it across President Donald Trump's desk. But Ocasio-Cortez is hoping for something narrower—the creation of a Democrat-led "select committee" to outline a plan for carrying out a GND within the next ten years. This proposal for a "Select Committee for a Green New Deal" is the closest thing to a comprehensive outline offered by supporters. The basic idea of the GND is simple. It operates by obvious analogy to President Franklin Delano Roosevelt's 1930s economic recovery program, which was built on massive government spending and intervention in every aspect of the economy. In the case of the GND, supporters have two purposes in mind: a) provide massive public investment and employment in order to b) rapidly transition the U.S. economy to a state of maximum environmental friendliness. Ocasio-Cortez's proposal for a select committee conspicuously leaves out a lot of the details of how, exactly, these goals would be achieved (a common theme in Congressional proposals to enact radical goals). Instead, it punts them to the committee's 15 members—nine Democrats and six Republicans—themselves. What the proposal does specify is the committee's expected output, a "detailed national, industrial, economic mobilization plan… for the transition of the United States economy to become carbon neutral and to significantly draw down and capture greenhouse gases from the atmosphere and oceans and to promote economic and environmental justice and equality." Light on details as the overall bill is, these features of the proposal suffer from a number of problems. Benjamin Zycher, who works on environmental policy at the American Enterprise Institute, told the Free Beacon that a ten-year window to implement 100 percent renewable energy was essentially impossible. He also pointed out the contradiction between a smart grid (which requires the ability to fine-tune power output as demand increases and decreases) and a fully renewable system (which is subject to the suboptimal fluctuations of sun and wind). "Either you have to accept constant blackouts when the wind's not blowing or the sun's not shining, or you have to have conventional plants on spinning reserve as back-up," Zycher said. Zycher also argued that many of these proposals, especially an effective smart grid, would require substantially more surveillance of Americans to actually enforce. Pointing to efforts in California to make water-meter checking a daily affair, Zycher said that a smart grid is "deeply problematic from a liberty standpoint." Much of the goal of Ocasio-Cortez's GND proposal does not seem to be about environmental policy at all. While light on solutions for actual implementation, the proposed bill incorporates a number of popular far-left economic ideas as part of "a historic opportunity to virtually eliminate poverty in the United States and to make prosperity, wealth and economic security available to everyone participating in the transformation." It is not obvious why such proposals are necessary to accomplish a GND. With unemployment at a 49-year low, a universal jobs guarantee seems unlikely to attract many takers (unlike New Deal programs such as the CCC). Others are justified only on the basis of the need to "promote economic security, labor market flexibility and entrepreneurism," all effects orthogonal to environmental renewal and not obviously in need of government support in the current economy. What is more, such programs would entail a massive expansion of government spending and power. 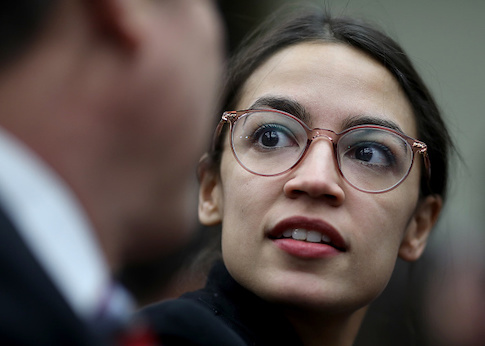 Chris Edwards, an economist at the Cato Institute, told the Free Beacon by email that in his view, "the plan seems more about [Ocasio-Cortez's] socialist leveling philosophy than reducing pollution." "Calling for ‘100% of national power generation from renewable sources' is extremely radical and would be enormously costly for average Americans," Edwards wrote. "Statements such as ‘a national, industrial, economic mobilization of this scope and scale is a historic opportunity to virtually eliminate poverty in the United States' are pie in the sky. Indeed, it would be the opposite. Forcing a massive shift to more expensive energy sources would create a costly burden especially for lower-income Americans." It is entirely possible that Ocasio-Cortez knows her proposal is both light on details and pie-in-the-sky; recent reporting indicates that the real goal of the committee would be to produce a campaign document for Democrats, rather than an actual policy proposal.